The Hungaroring. Dull track for single-seaters, yes. But there is an underlying subtext that makes it a - nevertheless - interesting event to have on the Formula One calendar. Bit of history and facts. I got handed my Friday Free Practice tickets the other day and I was already sinking into the warm tub of thought of going to my first ever Formula One event. Not too crazy about F1 to be extremely honest, but it is one of the biggest single sporting events in the year in Hungary. Why the Friday free practice, then? Well, mostly it is finance. Sunday and even Saturday tickets are off-the-roof expensive for most of the race fans residing East of the former Iron Curtain. Also, judging by our previous experience at the DTM race with Mikey, we figured being at the track is more of a "race experience" as it is hard to see the big picture of happenings (yes, there are huge screens in front of every grandstand, but I did not pay to watch TV). We decided upon watching FP1 and 2 as we would see about the same amount of passing (nought) as in the race and it's double the track time for significantly less amount of money. This is how I'm going to be at the track that is not too exciting but still interesting for those that are friends of history. 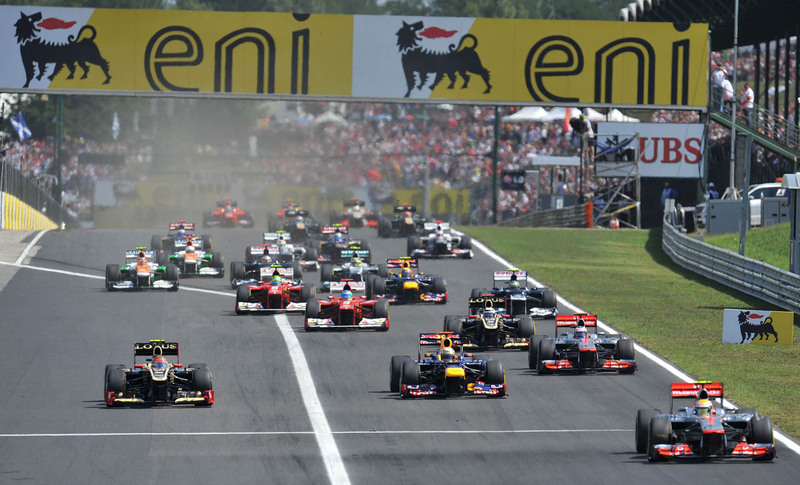 The first Formula One Hungarian Grand Prix was held in 1986, but that wasn't the first GP race in the country. To understand the whole picture, we shall travel through the past century. As the 20th century kicked in gear, Hungary was part of the Ausrtian-Hungarian empire that was kind enough to give World War I to the planet, but not much else. Even before that there was no significant heavy industry to talk about, the whole economy was based on land. That is how a local locksmith and engineer called Ferenc Szisz packed up and went to France to work on the machines he was interested in and was quickly employed by the Renault brothers. From engineer he became a riding mechanic, from a riding mechanic a race driver and as a race driver he became the first proto-F1 race and Le Mans winner at the same time. Then WWI happened, the monarchy was crushed, replaced by a republic that was quickly followed by a brief period of communist dictatorship, then the monarchy was restored that soon made allies with nazi Germany. You know the drill. There was a period between the late '20s and late '30s where a frat-pack of aristocratic drivers made several headlines in Europe's racing scene, including Africa-explorer László von Almásy and his friends, some of who made it as far as to become Bugatti and Maserati semi-works drivers to compete against the rising stars of Alfa Romeo, Scuderia Ferrari, Auto Union and Mercedes. It was the early '30s when the thought of a Hungarian Grand Prix was formulated and from year to year it was on provisional racing calendars but had to drop out each time. Apart from a round of European Hill Climb Championship and an annual speedfest, there was no truly significantly international racing event for cars. Finally, in 1936, there was a Hungarian Grand Prix held at Népliget (People's Park) in Budapest that was won by Tazio Nuvolari in the Ferrari-Alfa Romeo ahead of the German Auto Union and and Mercedes silver arrows. It was a non-championship round of the European Drivers' Championship (the direct predecessor of F1) and the race became a highly-praised event, but it did not return for the next few years and when WWII broke out it was already too late. Hungary - with its great sense of chosing the wrong side at war - entered WWII on the Axis side, switching to the Allies when losing out, only to be "freed" by the Soviet Union who were quick enough to establish a puppet, communist government and tried to eliminate all traces of the former systems (usually by turning the people to corpses or making them happy campers in Siberia). This included the remaining, former stars of Grand Prix racing, - who were either dead already while pursuing their passion to race, or fled or just kept a low profile. The memory of such "golden children" were erased, their prestigious race cars were taken over by the state (only to be recovered and restored by private collectors many decades later). It was now out of the question that any driver would race in the West, not even mentioning the lack of domestic racing scene. After the revolution of 1956, though, things started to loosen up. First it was the motorcycles. Then Budapest Airport, Népliget and Városliget (City Park) started hosting some international automobile races, attracting such stars as Niki Lauda or Jochen Rindt. Rallying became the motorsport for the masses as it did not need infrastructures, just country roads and rollcages in everyday cars. In the mid-'80s, when the establishment of the whole Eastern Bloc started crumbling, Bernie Ecclestone was quick to realise the marketing potential of the opportunity and wished to take his continental circus to this vacuum of capitalism. The idea was to race in Moscow city centre, but any similar attempts were turned down by Soviet authorities and Ecclestone was convinced to decide in favour of Hungary. Originally, Népliget was chosen as the venue for the race, but the idea was quickly scrapped due to the logistical nightmare the conversion and the annual havoc would have caused in the city. A permanent facility was decided upon - just outside of the town - to have the best of both worlds: a facility that disturbs no one other than some wildlife and nearby villagers, with all the infrastructure supported by the capital city - being at immediate reach. The layout of the track was chosen due to the safety concerns trending at the time - keeping the average speed low with the train of mid-speed and slow corners with relatively huge run-off areas. There isn't much room changing it as the track is in a natural basin, surrounded by hills from all sides, which was purposely designed to host as many people as possible from (then) fellow communist countries. As of today, the Hungaroring is still one of the (non-oval) tracks with the biggest seating capacities in the world with the positioning of non-start/finish line viewpoints enabling seeing at least as much as half of the whole circuit. The circuit is just shy of being called a 'classic' due to its undisrupted presence on the calendar in the last, almost 30 years and by being the last addition to it before 1998's Sepang Circuit in Malaysia, the first of many Hermann Tilke tracks. By the time its current contract expires in 2022 the tHungaroring will have been part of exactly half of all Formula One World Championship seasons in history. The first (then) communist country to host an F1 race and until this year, was the only one in Eastern Europe. It is true, however, that the track does not support exciting racing for open-wheel cars due to its layout (except when it's raining, but late July and August is rare in showers) and many people ask why it's still on the calendar in the first place. To put it simply, because the state back it. Without the backing of the government (and heavy tobacco advertisement formerly), there wouldn't be a race in the first place. There are words of the Nürburgring, the Hockenheimring, Monza, Spa, even Silverstone having financial and other troubles. There hasn't been a French Grand Prix in six years, which is probably the biggest shame of all (that is overshadowed by the presence of the Monaco GP). It is increasingly hard to find a sponsor and even more difficult to make profit. Numbers have shown previously that the Hungaroring would be better off without F1 financially, as the race usually generates loss if we are looking at the ticket sales only, but the proximity of the capital makes it a great tourist attraction and the money spent on the event by the government comes back from the tax it collected from the money spent by the tourists elsewhere. It is hugely different from other F1 races in the West in the sense that taking away the US GP would go unnoticed by most American citizens. Take away the British GP, a huge loss for the sport in general and British (motor)sport, but the economy wouldn't suffer much. Take away the Hungarian GP, you take away the third most visited tourist site in the country. Also, F1 put the country on the map for many and it is a strategic national image plan. That is why they try to keep the event to be consistent as much as possible and Bernie likes consistency and calculability. So why there hasn't been a major overhaul in years? Well, they have calculators at the government and they know their short/mid-term ROI well. Times have to change though, a complete resurfacing of the track is due and it has been rumored for years now that an overhaul of the circuit will be done to make the race more exciting on TV. Due to the lack of space, though, it is hard to pull off and it is likely that other than a few changes on one or two turns it will not happen. All in all, as much as I'm not happy with the racing on the track, I keep supporting it, because that is the only chance for many to see the biggest circus on the continent.